If you’re not sure whether you should hire AAA Locksmith or not, then you should read our testimonials below to find out what our customers think about us. You should also know that we strive to be the best we can be to serve you better in Volusia and Flagler Counties. For example, we promise to always answer the phone when you call! Locked myself out. Called someone else that turned out to be basically a forwarding service – they never sent anyone. Waited two hours, walked back to my neighbors and called David At AAA Locksmith. He picked up immediately and was happily doing a job nearby. He was there in 30 minutes, opened the door in about 2 minutes and was on his way to save the next poor soul. Thank you AAA Locksmith. Denny is very professional and I highly recommend using him. I called him last minute and he was more than happy to help. We went through all the options on my lock replacement and he knew very knowledgeable. Denny did some very hard work on the installation and honestly I was impressed. There is no question I made the right call to AAA Locksmith and would use in the future. I needed a Locksmith to rekey our office quick while I was in town and multiple companies told me that they were booked out more than a week! I called AAA Locksmith and they were at my business in 30 minutes. The fee was reasonable, service was just what I asked for and David is a true professional. I highly recommend and will continue to use this company! Once again AAA Locksmith aka Denny comes through! Prompt, friendly, professional, and great job! I locked myself out, and he was here fast. I had originally had my new keys made, and this time, I locked myself out. He made sure that my keys still worked. This is my locksmith in Daytona Forever . Denny was super professional, honest and did a quick and efficient job. 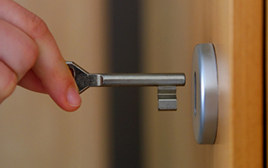 We’d easily go back to AAA Locksmith for any of our locksmithing needs. Very communicative, easy to work with, great attitude. We couldn’t ask for more. Have a testimonial or want to share your experience? Please give us a call today so we can share your feedback with our current and future customers!